I'm sitting at my computer working on some random little jobs. All of the normal stuff: answering e-mails, sending out a class mom message about a school event, checking in with my NJDMoms group. Daily things. But today... in the background... I have songs streaming from the new Disney Classics Box Set. Instead of working, I find myself reminiscing. There are movie songs... and theme park ride songs... and TV show songs. Each one brings up a memory. Movies and TV? The song from the Little Mermaid was Zoe's first dance recital dance. The song from Lion King... the little boy I nannied for (who is now a senior in high school and driving!!!) used to sing "PENN... SYL.... VAAAANIAAAAA..... that's where I'm froooommm" and "pink pajamas, penguins on the bottom, pink pajamas penguins on the bottom." Oh... and the song from Duck Tales. That song came on and I suddenly had visions of my brother and me in our pajamas watching cartoons on Saturday mornings. Disney ride songs? Don't get me started on how many times I've been to the Disney parks in Florida. No matter how many times I go... I never get enough. I have memories of being there with my grandparents, my parents, my high school friends (music department trip!!! ), my college friends (Spring break! ), and Nick. And now? Memories are being created with Zoe and Ana. This past August, we were so excited that we got to take my nieces and nephew to Disney World for their first visit ever. The kids will have ridiculous memories of me singing along with the Tiki Birds, the Pirates of the Caribbean, It's a Small World, and the Bear Jamboree. Oh... and the Carousel of Progess. Yes, I know all of the words. And yes, this is "The Best Time of Your Life". Disney is a big part of my personal history... and the music on the Disney Classics Box set brings those memories flooding back into my thoughts one song at a time. Do you have a favorite Disney song? Do you have memories that stay vivid thanks to a Disney tune? 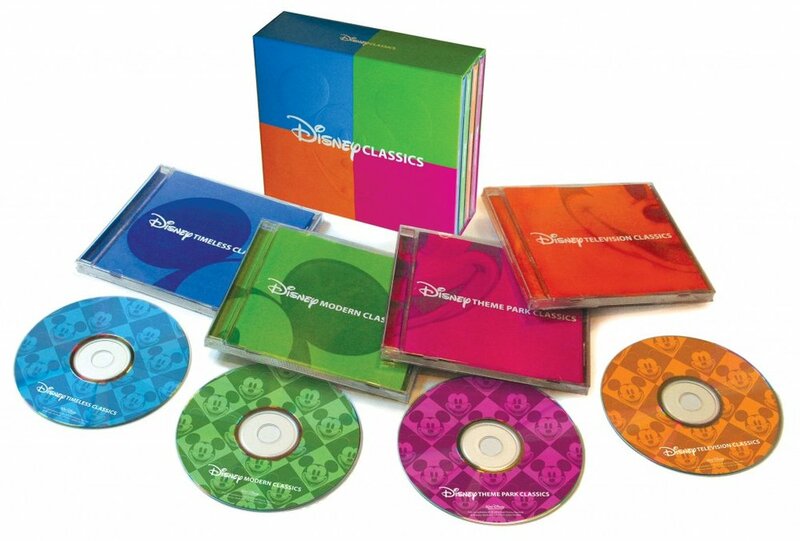 This new Disney Classics Box Set is available for purchase on November 12, 2013 and can be pre-ordered now. It is also currently available for purchase in the Disney Parks. The box set includes 4 discs of 94 original recordings. The 4 disks are Modern Classics, Theme Park Classics, Timeless Classics and Television Classics. And, as a special bonus, the box set includes this a cappela medley of Disney hits. You can find Disney Music on Twitter and Facebook.